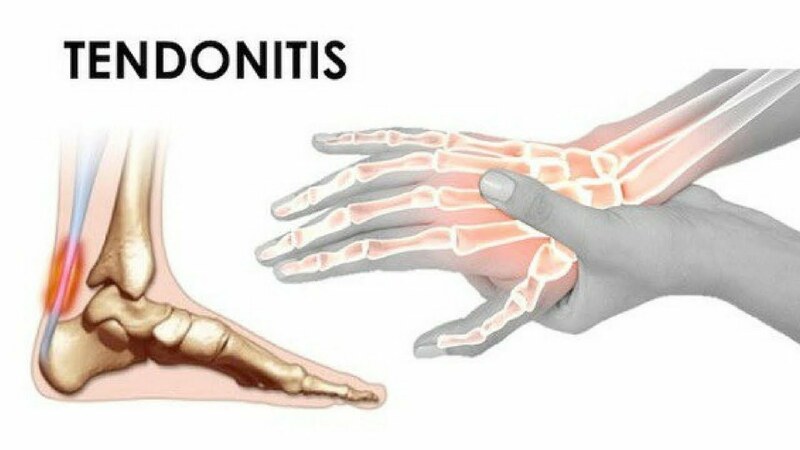 This is a form of painful inflammation which is happening in the tendons and they are chord – like parts of the body that are connecting muscles to bones. Those people who are older than 40 are having more chances to get tendonitis than younger people but every single person can develop it. Hands, hips, wrists, elbows, heels, shoulders and knees are some of the most common areas in the body where tendonitis happens. The symptoms of tendonitis can vary which depends on how long they last. There are some symptoms which are healing in a couple of weeks while other symptoms are lasting more than a few months. Also it depends on how severe your injury is, how much inflammation has developed and how long it has been going on. Some of the most common symptoms of tendonitis are trouble sleeping due to pain; stiffness; increased pain when moving or exercising; swelling and tenderness; feeling pains and aches around a specific ligament, joint or muscle. The most common cause for tendonitis is the repetitive movement. The most common activities which could lead to tendonitis are playing sports, running, cleaning or typing. You need to talk with your doctor if you suffer from tendonitis before you start using some of the below mentioned home remedies for this condition. Essential oils: Essential oils are very effective home remedies for tendonitis because they can reduce the pain and speed up the blood flow. You should try natural essential oils, such as peppermint, frankincense and cypress essential oils . You should mix two drops of each oil together with ½ teaspoon of coconut oil. You should apply this home remedy directly to the painful areas for 5 times per day with the help of warm compress because it will help them sink into the skin. You should soak in a warm bath infused with essential oils because this is also an effective home remedy. Avoid too much sodium and salt: All packaged foods have sodium. It is known that this element counteracts the potassium. If you consume it in too big qualities, then it can lead to a loss of important nutrients in your body which are needed to facilitate the healing process. This is a reason why you should avoid high – sodium foods as much as possible. MSM: This powerful nutrient can help in the treatment of tendonitis because it has anti – inflammatory properties. Also it has sulfur which is necessary for tendons to function properly. This natural cure works well for treating muscle aches, such as back pain and ongoing shoulder pain. Doctors are recommending 1,000 mg of MSM, 3 times per day but talk with your doctor to be sure if you should consume this dosage. Rest: This condition is often caused by an injury which happens as a result of misuse or overuse. It is very important to rest the injured tendons sufficiently because this will allow them to fully heal. It depends on the extent and location of your tendonitis to know how much time you should rest and when you can return to your activities. You should start slowly when you will return to your activities. Bromelain: This is an enzyme which is found naturally in the pineapple. It has anti – inflammatory properties . You should take 500 mg of bromelain, 3 times per day because this can help with the tissue repair. Avoid sugar and refined grains: It is known that the high levels of added sugars can decrease your immune function, increase inflammation, slow down the wound healing and it can lead to unwanted weight gain and all of these situations can make the tendonitis worse. This is a reason why you must avoid sugar if you want to heal your tendonitis. Collagen: We know that tendons and ligaments are made of collagen in large amounts. You should take this supplement to restore your collagen supply and to strengthen the weakened areas. Omega – 3 fatty acids: These fatty acids are needed for wound healing, proper immune response and controlling swelling . You should take 4 grams on daily basis, such as from eating seafood or wild – caught fish and you can take supplements. Ice packs: You should ice the painful areas because this will ease the swelling and also it is a very simple home remedy which you can do at your home. This home remedy is very important for the first day or 2 following an injury or when you have noticed that the swelling is developing. You should use ice packs to lower the symptoms of tendonitis by placing one on a barrier first, such as dish towel, paper towel or a piece of clothing and then hold it up to the area which hurts. Also there are many people who use a bag of ice cubes or frozen vegetables wrapped in a towel and pressed against the body for fifteen to twenty minutes at a time. You can use this natural treatment several times per day or until you have noticed a decrease in your pain. Avoid hydrogenated oils and fried foods: We know that refined oils are found in processed foods and they are a reason for inflammation because they are a source of Omega – 6 fatty acids which are pro – inflammatory agents. Bone broth: It is known that this natural cure has naturally collagen which is very beneficial in the healing process of tendonitis. The collagen helps develop and form tissue within the body. You can use the bone broth as your natural treatment for tendonitis but also use it if you have ligament injuries, strains and sprains. High – potassium magnesium foods: You should consume foods which are rich in potassium, such as bananas, greens, avocados and coconut water because they can speed up the healing process. The mentioned foods have also magnesium which is very important for healthy circulation, muscle recovery and helping you to get a good rest. Berries: These fruits are rich in Vitamin C which can help to rebuild the collagen which is an essential component of tissues. Also you should consume other foods that are rich in this vitamin, such as bell peppers, green veggies, squash and citrus fruits. Berries are also rich in antioxidants which can help in the fight against free radical damage which is one of the leading causes for increased injuries in older ages. Also you can consume pineapple because it has bromelain which is very effective in the treatment of swelling and injuries. Avoid alcohol and caffeine: It is known that the alcohol can prolong the inflammation and it can promote bone loss because it has some compounds which bind to calcium. Calcium is needed by our bodies to heal tissues which have been damaged. You should avoid caffeine overdose and also you should limit the alcohol consumption. Acupuncture: There are many doctors who are recommending acupuncture as a natural treatment for tendonitis. It can promote healing energy flow throughout the body and it can boost the natural healing mechanism which will speed up the recovery process . You should do this technique with a highly qualified acupuncturist. Lemongrass and marjoram essential oil: Both home remedies can be useful in the treatment of tendonitis when they are diluted and applied to the affected area. Both home remedies are toning to the connective tissue and they can be helpful when tendons no longer hold the joints with precision. You should make a skin test first because this oil can irritate people who have highly sensitive skin. You should dilute one drop to three drops of carrier oil, such as apricot kernel oil or fractionated coconut oil. It is not necessary to use both together. You can use just one of them. High – quality clean proteins: We know that protein is very important to help repair the broken – down tissue throughout the body. If you have protein deficiency, then it can cause bodily pains, fatigue, delayed recovery and weakness. You should try to get at least 4 – 5 ounces of quality protein pear meal. Some of the best sources of protein are grass – fed beef; cage – free eggs; raw dairy and wild – caught fish. All of the mentioned foods have zinc which can help in the tissue development and repair. Curcumin: This is an extract of the spice turmeric. It is often used in curries to give them a yellowish color. This is an excellent home remedy for people who have some kind of inflammation . Also curcumin can be used in the natural treatment of tendonitis. Chilies: They have powerful anti – inflammatory compounds, such as capsaicin  which can help you to reduce the pain and inflammation caused by tendonitis. Ali B, Al-Wabel NA, Shams S, Ahamad A, Khan SA, Anwar F. Essential oils used in aromatherapy: A systemic review. Asian Pacific Journal of Tropical Biomedicine. 2015;5(8):601-611. Aiyegbusi AI, Olabiyi OO, Duru FIO, Noronha CC, Okanlawon AO. A comparative study of the effects of bromelain and fresh pineapple juice on the early phase of healing in acute crush achilles tendon injury. Journal of Medicinal Food. 2011;14(4). Pearson SJ, Hussain SR. Effects of chronic omega 3 – supplementation on tendon structural and mechanical properties. Jacobs Journal of Sports Medicine. 2014;1(5). Neal B, Longbottom J. Is there a role for acupuncture in the treatment of tendinopathy? Acupuncture in Medicine. 2012;30(4):346-349. Hewlings SJ, Kalman DS. Curcumin: A review of its’ effects on human health. Foods. 2017;6(10):92. O’Neill J, Brock C, Olesen AE, Andresen T, Nilsson M, Dickenson AH. Unravelling the mystery of capsaicin: A tool to understand and treat pain. Pharmacological Reviews. 2012;64(4):939-971. Marigie is an Engineer who got her degree from the University of the Philippines. She is currently employed at a food manufacturing company. Working on this industry made her aware and knowledgeable on food and their medicinal benefits. Marigie loves to travel and learn about new cultures. During her free time, she shares her knowledge about health to the readers of this website.